Located between Paris and La Défense and steps from the banks of the Seine, Paris Asnières Park Residhome is in the newly renovated Les Grésillons district. An ideal place to stay whether you're traveling for business or pleasure, you can easily reach the capital as well as the Île-de-France region's major economic hubs. 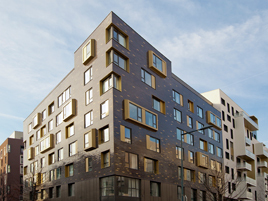 On the outskirts of Paris, close to the new QUARTZ shopping center, the aparthotel is also very well-connected to public transportation. The “Les Grésillons” train station on the RER C line, which will take you to Paris Porte Maillot in 10 minutes, is 350 meters from the residence. Asnières, a town rich in art and history, boasts prestigious historical landmarks including a quintessential 18th century chateau, 3 theaters, as well a conservatory. As for nature,, the promenade on the redeveloped banks of the Seine and Marguerite Yourcenar park offer a selection of exceptional strolls. Besides its excellent public transportation connections, Asnières-sur-Seine offers an economically attractive setting, with many companies' head offices in the vicinity. Open 7 days a week, the residential hotel is made up of 114 furnished, fully-equipped, and ready-to-live-in apartments, ranging from studios to one-bedroom units. Each unit has a fully-equipped kitchen, an LCD television, an office area, and a bathroom with a bathtub. Paris Asnières Park Residhome provides a wide range of complimentary personalized services available to guests, such as 24h reception and WiFi access. A la carte services and amenities are also available for an additional fee: breakfast from 7am to 9:30am, a laundry room and laundry service, housekeeping, parking, etc.